Burg Reinhardstein (also known as Burg Metternich) is a castle like no others in Belgium. Built in the 14th century, the castle was left in ruins in the 20th century, until a university professor decided to restore it to its past grandeur in 1969. Another characteristic that singles it out is that Reinhardstein, as it names indicates, was never really part of historical Belgium, but Germany. The castle is part of the so-called 'redeemed cantons' of the High-Fens region (around Eupen and Malmedy), that Germany ceded to Belgium after the First World War. Reinhardstein is just a few kilometers south of the Signal de Botrange, Belgium's highest elevation (694m). Reinhardstein was built in 1354 by Renuwar of Waimes with the authorisation of Wenceslas, Duke of Luxembourg. It is thought that the castle could have been built on a much older Gallo-Celtic construction. When John of Reinhardstein, grand-son of Renuwar dies in 1430, the castle passes to John of Zievel, who creates the seigneury and court of justice of Reinhardstein. His daughter, Agnes of Zievel, marries successively John of Brandschei and Henry of Nesselrode. Agnes' daughter, Catherine, inherited the castle and married Adrian of Nassau, Grand Bailiff of Vianden and Burgrave of Bütgenbach, son of Count John II of Nassau-Vianden. Adrian helped Willliam of Manderscheidt, Prince-abbot of Stavelot, to escape from the Prince-bishop of Liege, Everard of La Marck, who was coveting the castle of Logne. Adrian's daughter, Anne, inherited all the property, and marries William of Metternich , Bailiff of Neuernach and Sintzig. In 1579, Anne remarries to Henry of Plettenberg, Counselor of the Elector of Trier and Bailiff of Hillesheim and Schönberg. Anne died childless, and a trial, that was to last 150 years, opened to determine the heir of Reinhardstein. The court settled in favour of Theodore-Adolphe, Baron of Metternich-Winneburg-Bellstein, Chamberlain of His Imperial Majesty. Reinhardstein stays in the Metternich families until the French Revolution, passing respectively to Philip-Emerich Count of Metternich-Winneburg, Francis-Ferdinand, Count of the Holy Roman Empire and of Metternich, then Philip-Adolphe and John-Hugo of Metternich. When in 1750 John-Hugo passes away, his son and heir is none else than Francis-George-Charles, Count of Metternich-Ochsenhausen, last Plenipotentiary Minister of the Emperor of Austria in Brussels and Imperial Delegate at Rastadtt. The castle is sequestrated during the French Revolution, and given back in 1798, but the Metternich sell the property in 1812. The last owner's son was the illustrious Clement-Wenceslas-Lothaire, Prince of Metternich, who was Chancellor of Austria. He Presided over the Congress of Vienna in 1815, which had for task to redistribute the land of Napoleon's Empire after the Battle of Waterloo. The castle was last sold in 1885 for 300 marks. The proprietor donated Reinhardstein to Malmedy's Verschönerungsverein ("Embellishment Association") in 1902. Rumors that a treasure of gold and silver could have been hidden around the castle attracted numerous treasure hunters, who left the property in a pitiful state. In 1965, Conseil de Défense du Château de Reinhardstein et de la région de la Warche aquired the castle.Professor Overloop undertook to refurbish Reinhardstein in its entirety. The renovation were completed in 1971 after 6 years of hard labour, and Professor Overloop lived there until his death in 1994. Reinhardstein Castle is open on weekends and public holidays between 15 June and 15 September from 2:15 pm to 5:15 pm. It is also open on Tuesdays, Thursdays and Saturdays in July and August from 3:30 pm. Visits are only by guided tour (75 min), which can be given in English, French, Dutch and German. Admission is 5.50 € for adults, 3.50 € for people between 15 and 21 years old and 2.20 € for children from 6 to 12 years old. 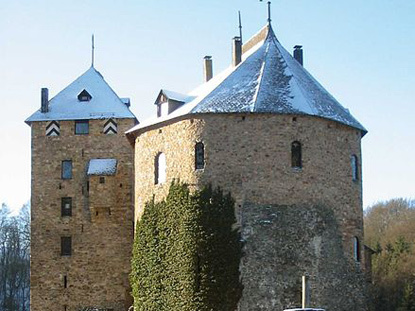 Reinhardstein is 6km north-east of Malmedy, near the village of Robertville. It is difficult to reach without your own vehicle. Malmedy is on the E421 (Verviers-Prüm) motorway, exit 11. From Malmedy take the N681 road to Robertville. Cross the dam on the lake of Roberville, then turn left, and left again before reaching the village's church (follow the indications for Reinhardstein). The castle lies well-hidden in the valley of the Warche. Visitors have to leave their car in a parking about 200m from the castle and continue on foot.